It had been raining all afternoon, dense cloud cover as far as the eye could see and I had pretty well given up any hope of photographing at sunset. We were staying in one of the cabins at the Old Faithful lodge (which I can highly recommend, by the way) and I decided to head to the visitor center to check on the next day’s forecast. 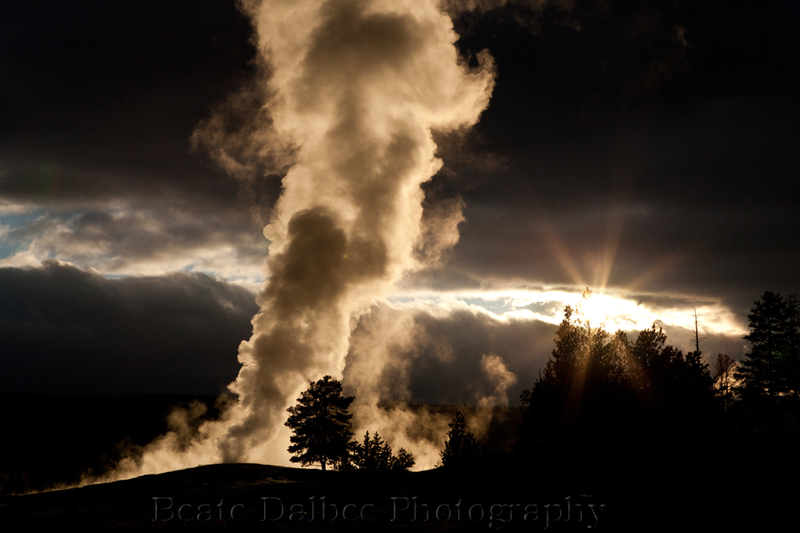 I did not get very far, when the rain stopped, the clouds parted just enough to let the setting sun peek through and illuminate Old Faithful. In absolute record time I raced back to the cabin, grabbed my camera and was lucky to quickly find a composition I was happy with. Yellowstone is always full of surprises. You just need to be ready to take advantage of them! You can find more images of my trip on my website. Good advise Beate! I can remember countless times I thought the show was over, when in fact it had only just begun. Yours is the kind of shot that I did not have time to try to get while there. Instead I settled for mid afternoon, blaw light that did nothing to inspire the beauty of Old Faithful. I will go back one day. Great job on your photo! Thank you Bob! Just another reason to return to Yellowstone 🙂 – as if a reason for that was needed. Amazing place! This happened to me recently as well – I thought the sunset colours in the clouds were done but they were just waiting until I got back into my car! Managed to get the shot though. I like this shot a lot though – glad it worked out for you. Thank you! Nature is always good for surprises!